Norway, White and Blue Spruce trees. 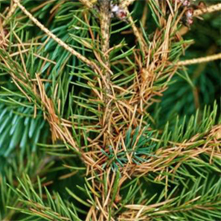 Even light infestations of needleminers can give Ornamental Spruce trees an unsightly appearance. At times they can cause severe defoliation of both ornamental and forest trees. 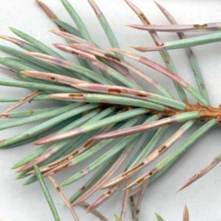 The best symptom for field diagnosis is the presence of densely webbed needles. Larvae build unsightly nests of dead needles and frass, held together by fine silk strands. 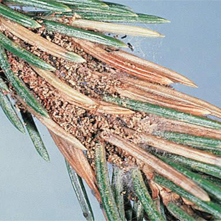 Several species of moth larvae mine Spruce needles. Small grey moths appear throughout infested plants in late May and June. The female deposits a group of pale green eggs on the base of the needle. The newly hatched larva bore into the base of old needles then mine the interior. Young larvae feed in groups, while older larvae feed alone. When the interior of the needle has been consumed the larva often cuts it off. The needle remains attached to the other dead needles by silk strands. Feeding continues until the first heavy frost, when each larva enters a hollowed-out needle and spins a web over the opening to overwinter. It emerges again in the spring and resumes feeding until ready for pupation in mid-April. Larvae become social in the spring with two or more living within each web. Apply controls to foliage about mid-June and repeat in late June. In fall or in spring before buds swell, dislodge nests with a strong stream of water.